My experiences with African-American literature are pretty limited. I read James Baldwin’s Another Country in high school and a wide selection of Toni Morrison’s works for my English Major Senior Seminar in college. 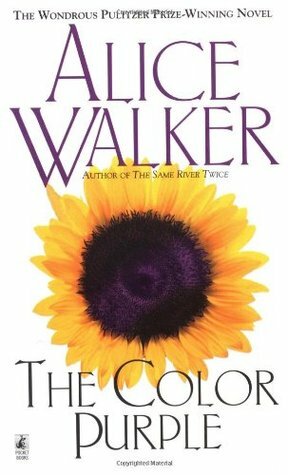 I’m not surprised that my curriculum skipped over Alice Walker’s The Color Purple, though I am a bit sad that I can’t say I read it when I was younger, worldly in my youth. But like most, I chose to read what was popular. As with most of the books I’ve read that fall under “classic lit,” perspective plays a key role in my understanding of this text. The book is about a woman named Celie who is given to a poor, widowed farmer to wed and take care of his children and home. Her husband, Mister, is abusive and lazy, leaving the household to be run by Celie. His son from his first marriage, Harpo, is just like his father when he marries Sophia. To get Sophia to mind him he tries to beat her, but she fights back and eventually leaves him for a time. Before Celie’s marriage to Mister, she had two children from her Pa, who were adopted by a missionary family. Celie’s sister Nettie, was actually the one Mister wanted to marry, but Celie was given away instead. Her sister runs away and eventually gets to Africa with some missionaries and lives in a tribe for several years. The tribe is eventually colonized by the Dutch. Celie’s abuse all her life is horrible and tragic, and it seemed to be in a constant cycle for many families at that time (except for missionaries, apparently). Celie’s thoughts frequently return to her children who she sees one afternoon in town. What makes it even more sad is that she starts the book off by making the reader think that she’s okay with it. It’s in God’s hands and she keeps her faith. But as the story continues, and she finds out Mister has been keeping Nettie’s letters, her own voice doesn’t search for God, only her sister who, besides Shug, is the only person who ever loved her. What I gathered from Walker’s work is that this is an awakening. In the beginning of the novel, Celie has a narrow view of the world, but when she meets and speaks with other women, her perspective widens. Shug Avery is able to awaken Celie sexually. Sophia is able to awaken Celie to stand up for herself (which she then teaches Harpo’s second wife, Squeak). Nettie is able to bring a worldly perspective to Celie. Celie’s multiple awakenings eventually allow her to be her true self, something that is difficult during this time period–1930-40’s (though the date is not explicitly clear). She gets to a point where she understands her attraction to Shug, and she also has her own business making pants for women. Further, she’s able to forgive Mister for his past treatment of her. They bond over their mutual love of Shug. The greatest awakening, in my mind, was when she was able to see Nettie after being apart for 30 years. Their reunion was the cherry on top of the “hard-times-are-over” cake. By the end, the reader feels hopeful for Celie’s (and her family’s) future. This novel is a powerful addition to the American Literature canon. I hope it is taught more in schools to give students a better understanding of life after slavery and how some of these issues are still a problem today.